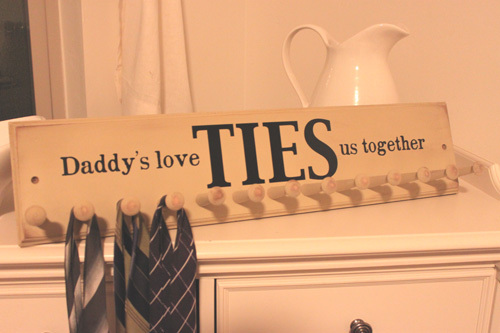 Ties are pretty common Father's Day gifts, so why not add a tie holder into the mix? As you know, I have an unhealthy obsession with shaker pegs and buy them in bulk. If you are not quite so obsessed, I would suggest buying little hooks. It'd probably be cheaper. If you like the look of Shaker pegs, you can find them at most hardware stores and I've seen them at Hobby Lobby. Hobby Lobby seemed to have the best prices. The board I used an mdf board that was 26''X6'' and 3/4'' thick. You can buy 6'' boards at Home Depot and they will even cut them down to the right size for if you'd like. I measured the center of the board to find where to place my first hole and then worked my way out. but odd numbers are easier to center. I put the pegs 2'' apart. Much closer than I would for a coat rack. I want to be able to stuff it full of ties. 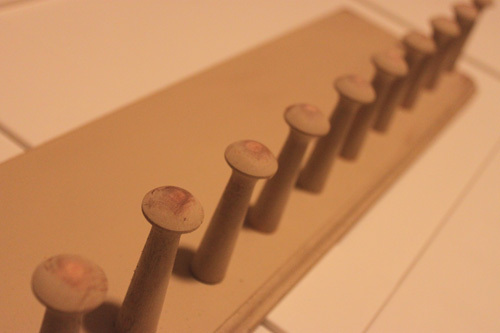 Stick a little bit of wood glue on the back of the pegs before tapping them into place with a hammer or mallet. This will keep the pegs from slipping out over time. It's probably not as necessary with a tie rack since ties aren't heavy, so if you don't have wood glue, don't stress about it. I find that folding my vinyl helps me to get it centered on the board. The vinyl itself is 3.5'' X 21''. Happy early Father's Day Joe! The vinyl for this project it is $6. 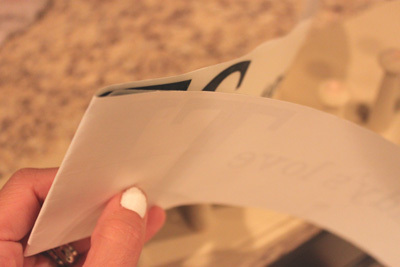 If it's purchased separately, the shipping is $.50 because it can be folded and fit into an envelope. Shoot me an email if you are interested and I'll send you a paypal invoice. Very cute, if only my hubby wore ties! Love it! Where did you get the board for the back of it? That is so cute! I love the saying! I saw a pic on pinterest with a baby wearing a diaper and daddy's tie. If I knew how to tie a tie, I'd take a pic and use that caption! How do you get the vinyl Lettering? Can I order it? 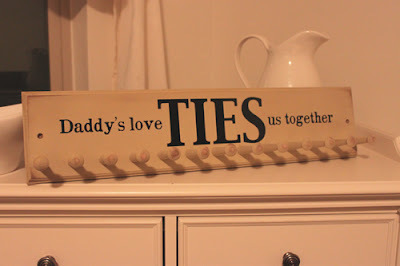 I would love to make this with my kids for my husband for Father's day this year and maybe include their little handprints on it as well...Thanks so much for the wonderful idea! Hi! 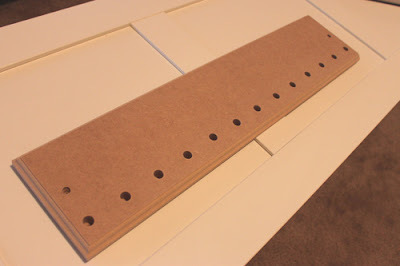 Since you have an obsession with shaker pegs and have access to a drill press, would you be willing to make this item and sell it? If not, where can I find the items to make this? My husband is in desperate need of a tie rack. How big is your board? Where can I find the pegs? Would you email me at thebjorns@hotmail.com? Great idea! Thanks. 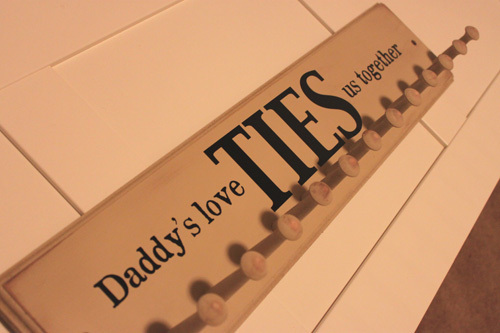 Love this tie rack and I'm really wanting to make it for my hubby for Father's Day. Where did you find the materials to make it? What are the measurements or the board? Thank you!! I'm going to make this for my hubby :) about how long are the shaker pegs? If you could email me at brittloveskyle @gmail.com that would be amazing! Thanks so much for sharing this great idea! I featured this idea on my blog today in a post of cute Father's Day gift ideas! Can you share what size of pegs you used? I found so many different sizes to buy but am not sure which would be best for this project. I've never used shaker pegs before so no idea. Please email me with the info. Thanks. I send you an email, but for anyone else that may be interested, they are half inch at the base and 3.5'' tall. cool idea, worth a space on my Fathers day gift ideas . Hi I would like to purchase the lettering. How can I get it and how soon? I would love to do this for my husband's birthday of the 24th of September. Love this! Where did you get your board? kristaaschliman@gmail.com Thanks! including motorized tie racks, and tie and belt organizers that mount in a custom closet. Organise and store your neckties with thistie rack that fits on a wardrobe hanging rail. Compact and easy to access storage.